Wolffia from the Po River of northern Italy. The distance between fingerprint ridges is about 0.3-0.4 mm. These are indeed minute flowering plants. Photo by Nicola Ardenghi. The following images were taken from a dry sample sent to me from Nicola Ardenghi of the University of Pavia, Italy. The sample appears to be the single species Wolffia columbiana Karsten mixed with a few small plants of Spirodela polyrrhiza (L.) Schleiden. The size of most individual plants is only 0.4 to 0.5 mm long (length & width are almost the same). Unfortunately, dried, flattened individuals resemble green specks. When hydrated they have a circular (rounded) shape and a transparent green color. Although they are in the size range of Wolffia globosa, their circular shape resembles minute W. columbiana rather than elongate W. globosa. According to Nicola Ardenghi (personal communication, 2016), the low number of stomata (less than 10, with the exception of an individual bearing 12 stomata) confirms the exclusion of W. arrhiza which has 10-100 according to Landolt (1986). W. columbiana has 1-15 (rarely up to 30) stomata. In addition, W. arrhiza has a dark green (non transparent) upper surface. Taking into account the temperature limits of the coolest months reported by Landolt (1986), it seems that only W. columbiana (-8°C) is compatible with the winter temperatures of the northern Italian site (where they usually drop below 0°C). 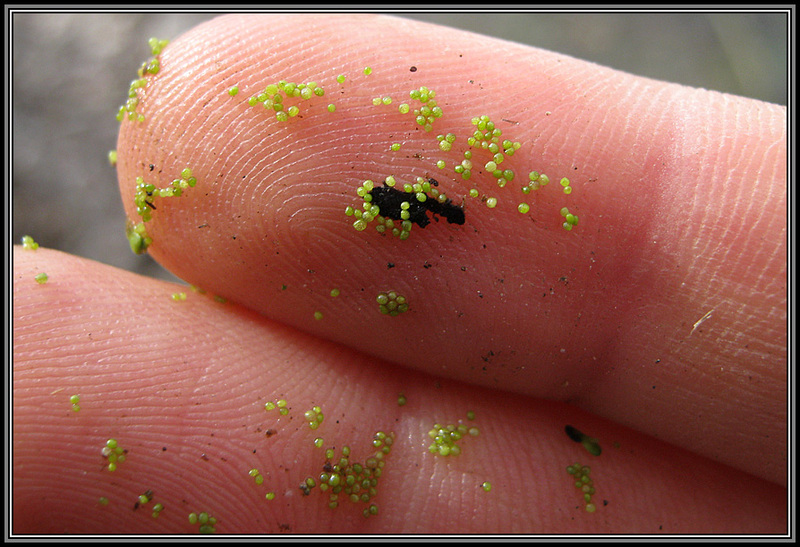 I found a few larger individuals in the sample that approach the size of typical Wolffia columbiana: 0.5 to 1.2 mm wide (1 to 1 1/3 times as long as wide). I must admit that it is difficult to be absolutely certain about the small plants, except I observed a daughter plant break away from a larger mother plant and it matched the size and shape of the small plants in sample. 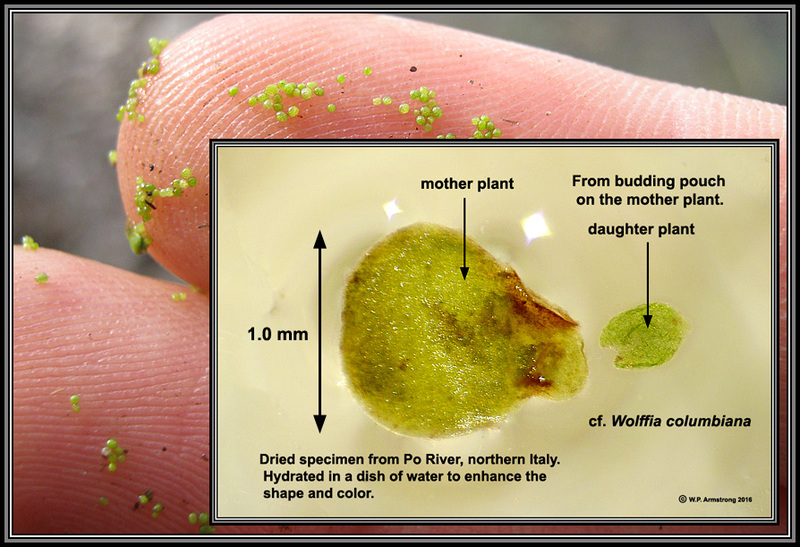 The following website on Wolffia may shed some light on the size difference in this sample. My hypothesis is that the minute plants are daughter plants from larger individuals from the previous fall or winter months. Or, perhaps these came from overwintering turions described under "Habitat" in the following link. Other species of Wolffia produce starch-filled turions which resemble small plant bodies that sink to the bottom during cold winter months. 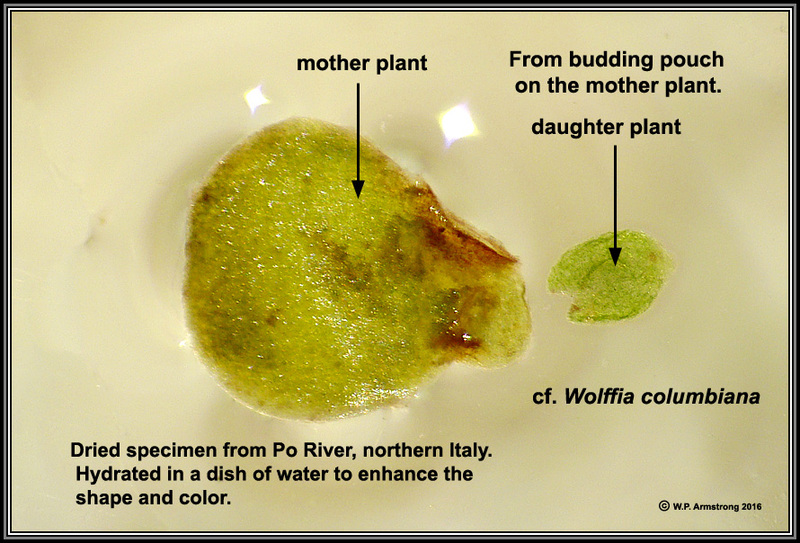 In any case, the Po River Wolffia appear to be a new (young) population of small individuals that came from plants that survived the previous winter. It is a shame that fresh specimens can't be sent through the mail in this troubled world of drugs and terrorist activity. It would be interesting to grow them and study their development. Landolt, E. 1986. "The Family of Lemnaceae: A Monographic Study" (Vol. 1). Veroff. Geobot. Inst. ETH, Stiftung Rubel 71. Schmitz, Ulf, Kohler, S, and A. Hussner. 2014. "First Records of American Wolffia columbiana in Europe--Clandestine Replacement of Native Wolffia arrhiza?" BioInvasions Records (2014) Volume 3, Issue 4: 213-216. Dried Wolffia plants from the Po River, northern Italy. They are pretty unrecognizable in this state: About the size and shape of course ground pepper grains until they were hydrated See hydrated plants in next image. 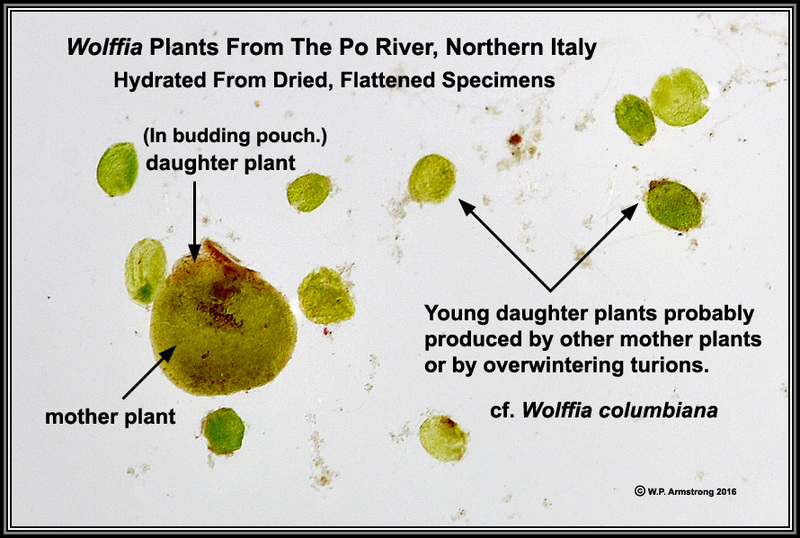 Wolffia plants from the Po River, northern Italy. They were hydrated from dried specimens. See dried plants in above image. The larger plant appears to be Wolffia columbiana and the smaller plants are probably daughter plants produced by budding. 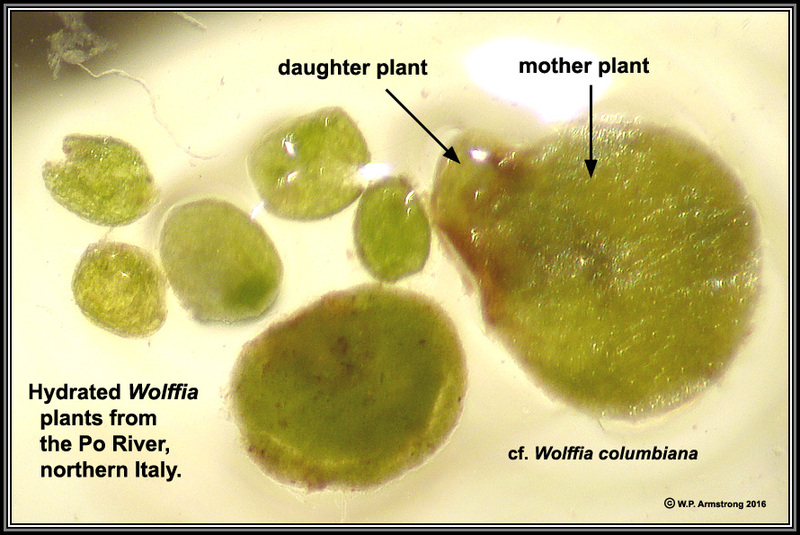 A larger Wolffia columbiana mother plant from the Po River, northern Italy. The smaller plant is a daughter plant that came from budding pouch on mother plant. Wolffia columbiana from the Po River, northern Italy. I must admit that the "mother plant" resembles the general shape of a Spirodela polyrrhiza turion (see next image), except it is smaller and lacks the brown pigment cells. These dried, pressed plants were the size of course ground pepper grains until they were hydrated; however, they did not fully resume their complete 3-dimensional shapes. This made 100 percent identification very difficult. 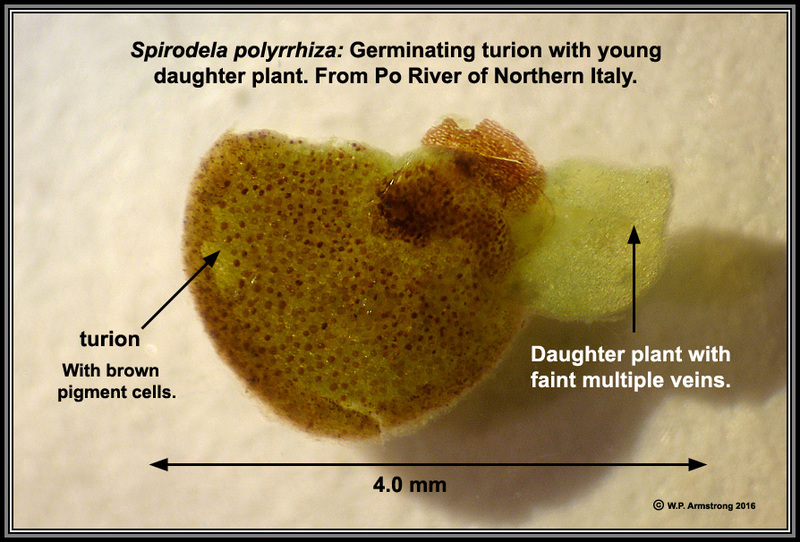 A germinated Spirodela polyrrhiza turion with developing daughter plant. 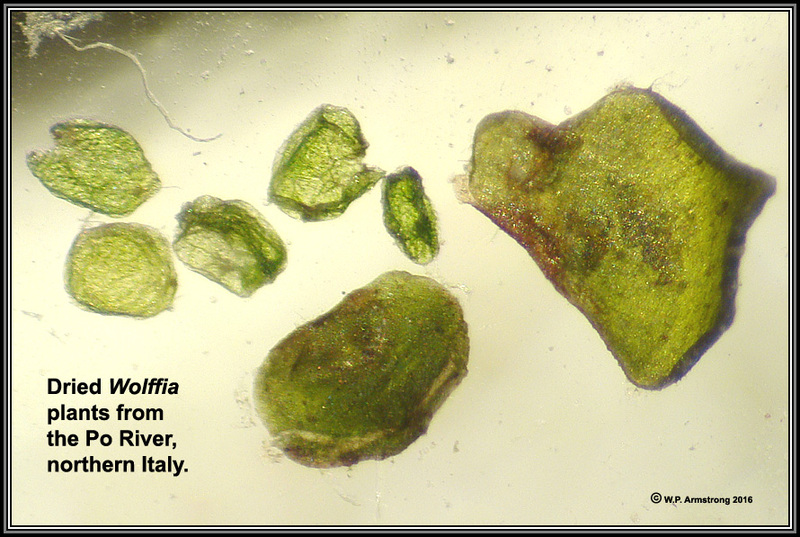 This was found in the sample of dried, pressed Wolffia columbiana from the Po River, Italy.